It’s Kate Walker’s first day as a member of the Home Office Enforcement Team and she not only has to evict an illegal immigrant from his home, but from the country. The problem is that the immigrant, Vincent Mpolo, doesn’t want to comply. He manages to escape and Kate is blamed for his flight. When it is discovered that Vincent left a dead body behind, Kate decides that she has to track him down, even if it means breaking the law in the process. Professional pride is at stake and something else too: Kate isn’t entirely sure that Vincent is the murderer. Her search takes her to the UK border and she soon finds out that it’s one thing for an illegal immigrant to enter the country, but quite another to escape. 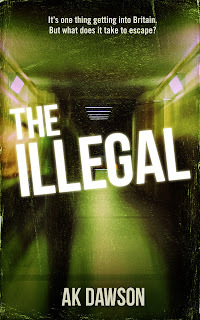 The Illegal is a fast-paced thriller set in North East England. It is a full-length novel.